Birthdays are a great time to show our appreciation to the special people in our life. 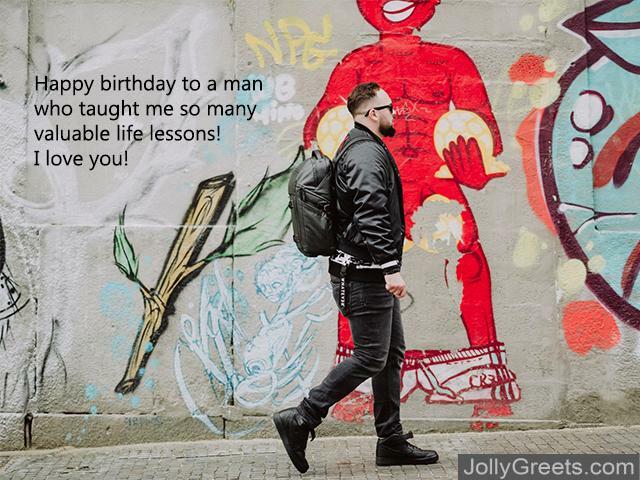 No doubt, you have special men in your life who deserve celebrating: family members, friends, romantic partners… and when their birthdays come around, you want to make sure they know how loved they are. But coming up with the perfect birthday wishes can be hard, especially when trying to make sure they are the perfect wishes for the great men in your life. We know how hard this task can be so we’ve compiled a list of birthday wishes that are perfect for male birthday celebrations. Take a look at our list below and let one of these choices lead you to create the perfect birthday wish for that special guy in your life! 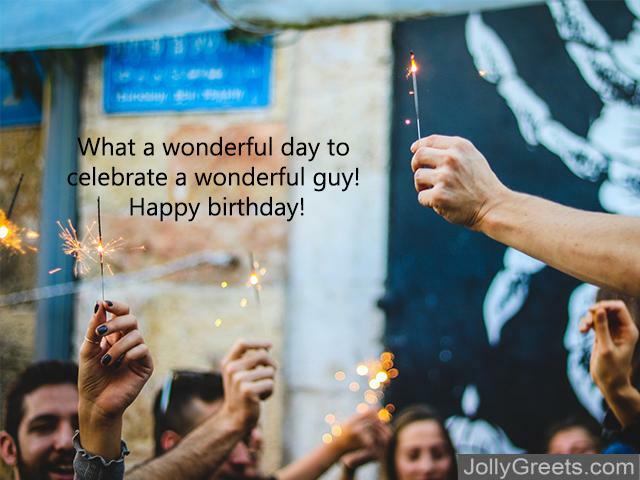 These birthday wishes are perfect for that wonderful man in your life who doubles as a great friend. Happy birthday to the most amazing guy I know! It’s been a pleasure knowing such a fantastic man! Happy birthday! You’re a guy who really knows how to party, so let’s celebrate your birthday together! What a wonderful day to celebrate a wonderful guy! Happy birthday! Happy birthday to one of the coolest dudes I’ve ever known! Wishing a brilliant birthday to such a brilliant birthday boy! So glad to be celebrating such an incredible man’s incredible day! Happy birthday! Happy birthday to a great guy who knows how to have fun and make me smile! Happy birthday to a fantastic guy: you! Let’s celebrate! As you celebrate today surrounded by people who adore you, I hope you take some time to reflect on what an amazing guy you are and how lucky we are to have you in our lives! I hope you enjoy your special day and our friendship continues to last so many birthdays more! Happy birthday. Happy birthday to a real party animal who always knows how to have a howling good time! You’re the guy who can always bring a smile to my face and give a good laugh when one is so desperately needed. Today is a day to celebrate, so let’s all cut loose and have some fun! Here’s wishing that your next year is filled with exciting adventures and many successes! You are a fantastic man and I am so honored to be able to call myself your friend. I can’t wait to see how this next year will treat you! Happy birthday and let’s celebrate! These birthday wishes are written for male relatives and will be perfect for your father, uncle, grandfather, etc. Happy birthday to a man who taught me so many valuable life lessons! I love you! Happy birthday to the best dad/uncle/grandfather/etc that someone could ask for! My wish today is that we continue spending time together and bonding! Happy birthday! Thank you for watching out for me as I grew! Happy birthday! Happy birthday to the most amazing dad/uncle/grandfather/etc anyone has ever know! I’m so proud to be family with such an amazing man! Happy birthday! Loving wishes for the greatest guy I could ever ask to be related to! Happy birthday! You are the most amazing man on the planet and I’m so glad we are family! Happy birthday! Best birthday wishes to the coolest dad/uncle/grandfather/etc around! Happy birthday to my favorite dad/uncle/grandfather/etc! I am so lucky to have had such an amazing guy around that I could look up to. You are so patient, so hard-working, and so inspiring. I hope that your birthday celebration today is just as amazing as you are! Happy birthday dad/grandfather/uncle/etc. Real heroes don’t always wear capes: they also make bad puns and grill up the best BBQ around town! Thank you for always being my hero and teaching me how to grow up as wonderful as you are. I’m so happy we get to celebrate your birthday today! Happy birthday, I love you! Happy birthday to the hardest working, funniest, smartest, most amazing dad/grandfather/uncle/etc I could ever ask for! You continue to make my life wonderful with your presence and I am so happy to celebrate this year with you. Happy birthday and well wishes for this next year together! 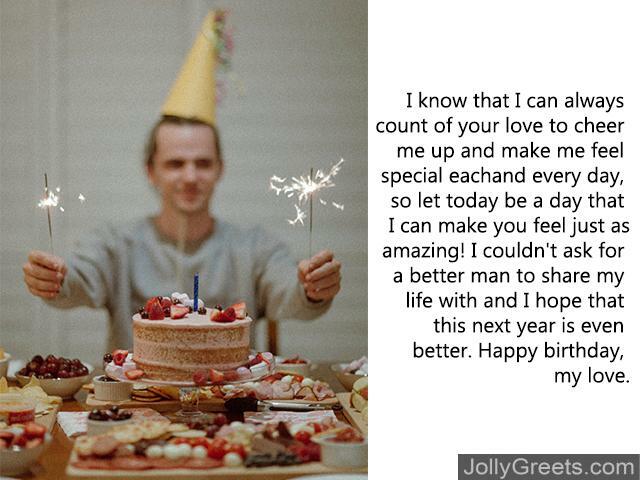 These birthday wishes are ideal for a male romantic partner and will be sure to make him swoon over your care. Happy birthday to the man who completes my life. Happy birthday to the cutest guy around! What’s cookin’, good lookin’? Probably your birthday cake! Happy birthday! I’m so thankful to share my life with such a wonderful guy. Happy birthday! Happy birthday to the man who I’m so grateful to share my life with. To my amazing husband/boyfriend/etc who always makes me smile: happy birthday! I love you so, wonderful man of mine. Happy birthday! Even if your beard scratches me when we kiss, I still love you to death! Happy birthday! Each year that passes is another year I get to spend with the best husband/boyfriend/etc. Happy birthday! Happy birthday to the guy who is too good to be true! There are not enough words to describe you, but let me try: wonderful, fantastic, amazing, irreplaceable, spectacular… the list just goes on and on! Wishing an incredible birthday to the most incredible man in my life. May this next year be full of success and adventure. I know that I can always count of your love to cheer me up and make me feel special each and every day, so let today be a day that I can make you feel just as amazing! I couldn’t ask for a better man to share my life with and I hope that this next year is even better. Happy birthday, my love. When I’m not with you, the sun isn’t as bright, the flowers aren’t as beautiful, and the days just aren’t the same. You complete my life and I am so blessed to have found such a wonderful man to share my love with. Happy birthday, darling: I hope today is every bit as amazing as you are!